The Spence J valve is our latest kit to be added to our ever growing mounting kit list. We hope that this kit will open even more doors to customers who are looking for a good reliable positioner. For more information please email Tammie. Can a V100/V200 product be operated on a 180 degree application? Yes, and with our standard C1 cam. Good for three way valves or valves/actuators with slave linkage the standard Cam can also be used for split ranging. Split ranging is when you have two control valves on one input signal and you need one valve to open from 3 to 9psi (4 to 12mA) and the other valve to start to open from 9 to 15 psi (12 to 20 mA). 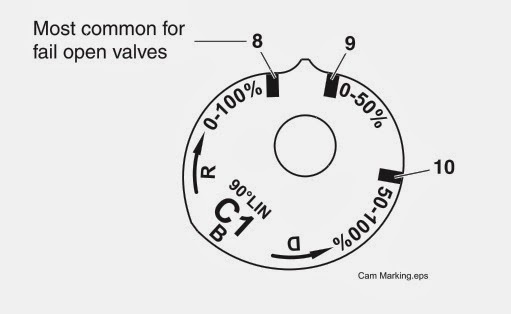 For the 180 degree rotation for direct acting you will need to set the cam up with the roller where number 9 is displayed in the picture below. As always if you have any question please give us a call. Or you can email our technician Matt Dill. In this addition of the VACPAC we want to remind you of our training dates in March 4th- 5th and May 13th - 14th, announce we will be stocking the Soldo EX switches, have added another linear kit and provide another "technical tip". We look forward to working with everyone to make 2014 a great year. Valve Accessories has teamed up with Soldo to offer Explosion proof switch boxes. The unit pictured is piggybacked on a V200EX it will also piggyback onto a V100EX (or IS if needed). The Soldo can be mounted to either V100EX or V200EX using the VAC designed 3rd party (Westlock or Stonel) or now Soldo mounting kit. With this move you can get the EX positioner, the adapter kit, and the EX Feedback from one source. VAC will be stocking the most popular two units the switch only and the combo unit of switches and 4 to 20 mA feedback. Please call us at 205.678.0507 or email Tammie for pricing and availability. More information can be found here about the Soldo switch. Our popular training classes are set for March 4th and 5th and May 13th and 14th . The training class (1 1/2 day) includes detailed hands on shop time, some classroom discussion about product features and benefits, markets, competitor discussions, and even some team competition. Plenty of time for questions and answers and "socializing" is mixed in as well. You come away with certainly more positioner knowledge as we start with "Positioner 101" and end with the latest trends in digital technology, and get to meet interesting counter parts within the markets we serve. The March class has one opening and the May class is open. If you have any interest in attending or sending someone to our class please let Tammie in our office know by emailing her or calling her.